Was anyone else aware of this ridiculousness? 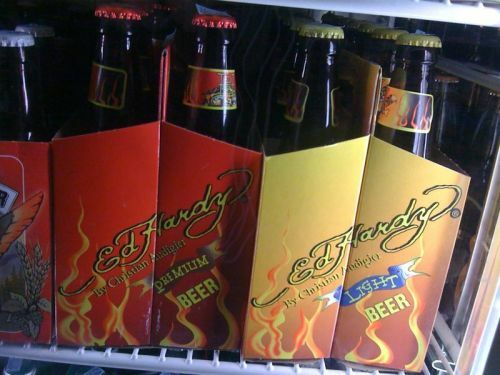 Yesterday while cruising the beer section at Harris Teeter for far too long, I came across not one, but two varieties of Ed Hardy beer. I almost fell backwards right into the North Carolina red wine section. I can only imagine the distinct flavor of the hops, barley, and hair gel this is brewed with. The most offensive part? Besides the vicious lion and one-eyed skull on the packaging? They costs $9.99 per 6-pack. The slogan on their website says "It's not just a brand. It's a lifestyle." I'll say! No truer words have ever been spoken.